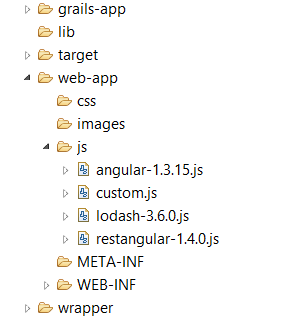 I've been trying to install the angularjs/restangular js libraries in my Grails app based on a chapter in Grails In Action. The problem is that the code in this book uses the resources plugin which has been replaced in the version of Grails I'm using (2.4) by the asset-pipeline plugin. <r:layoutResources/> <-- why is this highlighted as 'unknown'? <r:require module="core"/> <-- again, this is unknown! Not the answer you're looking for? Browse other questions tagged grails asset-pipeline or ask your own question. How to disable logging of asset pipeline (sprockets) messages in Rails 3.1? How to group JS and CSS using Grails asset-pipeline plugin?